I don't wanna rub it in, but it's January and I GRILLED Pork Satay OUTSIDE, on the patio, in short sleeves. It's one of the big reasons I love living in California. I grew up in North Carolina and I miss the varied and equal climates; 4 distinctive seasons, but I do NOT miss cold weather. Another reason I love living here is the opportunity to meet, experience and learn about so many different cultures; most of the time right next door. Thai food has become one of my favorites, so when this month's DARING COOKS CHALLENGE was Pork Satay it was...like...awesome dude. Even Cuppy was clear that this recipe is not exactly authentic Thai or Indonesian, but a simple and pretty terrific English version of a great Thai dish. 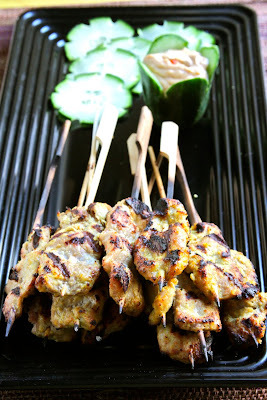 Satay is also made with Chicken, Beef, Lamb, Tofu and in some regions, even Turtle. Credit for its origin is often given to the Javanese street-vendors. All over Southeast Asia there are still street vendors selling Satays along with the highest price restaurants. I enjoyed making and serving these Thai-inspired skewers, but certainly agree that it's a "soft" version of a classic. 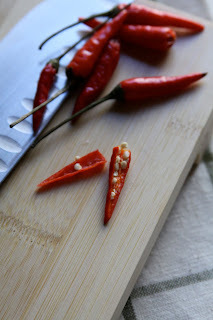 A couple things this recipe does have in common with authentic Malaysian, and Indonesian recipes are: Using Tumeric, for the color and earthy base, and marinating for deep flavor and tenderness. I used Pork Tenderloin for mine (just because I already had it), but much cheaper and tougher cuts can be used since the marinade will help break down muscle fibers and make the meat melt-in-your-mouth tender. 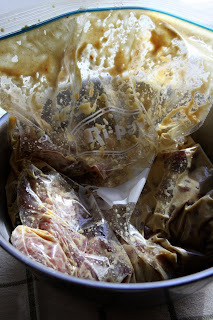 I marinaded the pork slices in a large zip-lock bag, (along with the scraps that I used later for a quick Wok-lunch) in a bowl held in the refrigerator overnight. 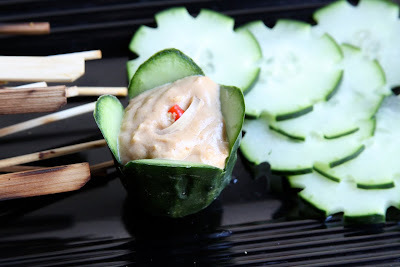 I made the Peanut Sauce a day early, then reheated it with a little Coconut Milk and served it on the plate in a Cucumber bowl cut from the end of the cucumber along with some Rice Vinegar- marinated Cucumber slices. I threaded the marinated pork strips onto wooden skewers (that had soaked in water for about 30 minutes to reduce having them burn.) Then, I grilled the Pork Satay over Med/High heat for about 5 minutes on each side, glazing with marinate once when I turned them. This was a pretty simple process (especially as Daring Cook's Challenges go.) You can broil these in the oven, too, and serve with flavorful rice and a light salad; a healthy, easy, light dinner and kids always think the skewers are fun and different. Thanks, Cuppy! Husband said, "These are smokey, in a great way." 1a. Cheater alert: If you have a food processor or blender, dump in everything except the pork and blend until smooth. Lacking a food processor, I prefer to chop my onions, garlic and ginger really fine then mix it all together in a medium to large bowl. 2a. Cut pork into 1 inch strips. 3a. Cover pork with marinade. You can place the pork into a bowl, cover/seal and chill, or place the whole lot of it into a ziplock bag, seal and chill. 2b. Cut pork into 1 inch thick strips (2-2.5 cm thick), any length. 3b. Cover pork with marinade. You can place the pork into a bowl, cover/seal and chill, or place the whole lot of it into a ziplock bag, seal and chill. 4. If using wooden or bamboo skewers, soak your skewers in warm water for at least 20 minutes before preparing skewers. 6. Broil or grill at 290°C/550° F (or pan fry on medium-high) for 8-10 minutes or until the edges just start to char. Flip and cook another 8-10 minutes. 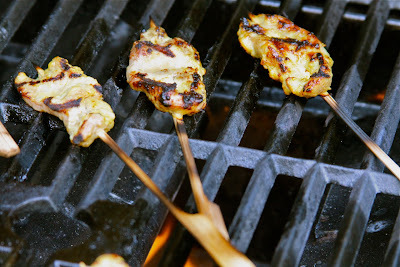 * If you’re grilling or broiling, you could definitely brush once with extra marinade when you flip the skewers. 1. Mix dry ingredients in a small bowl. Add soy sauce and lemon, mix well. 2. 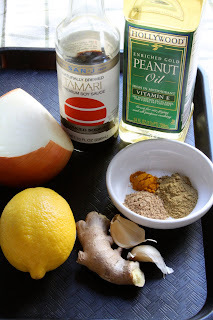 Over low heat, combine coconut milk, peanut butter and your soy-lemon-seasoning mix. Mix well, stir often. 3. All you’re doing is melting the peanut butter, so make your peanut sauce after you’ve made everything else in your meal, or make ahead of time and reheat. Mix well. Serve chilled or room temperature. I adore your pictures, the food looks delicious and how could I not love the presentation? The cucumber cup is unbelievable cute. My kids would love something that this on there plates. Yeah, yeah, so what if it is warm where you are grilling. Callfornia living makes you soft. Did I write that or just think it? Maybe a little envy bleeding through. Great work on this month's challenge. Smokey in a good way!!! Love your satay it looks so delicious well done. I love the charred surface on the satay. Bravo on a great challenge. 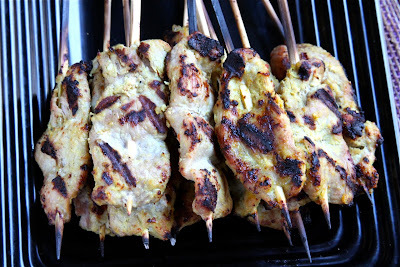 Lovely photos, your satay looks great! I'm jelous of you being in California where you can grill in short sleeves - we have like 5 degrees F here. Shudder! Great job on the challenge! Great job on your challenge and the satays look so delish. Love your pictures! Thanks SO much for the comments, you guys. I've been working on my photography and it means a lot to hear good things back. I'm glad you got my humor about the weather,too. Great comments can really make your day, right? I appreciate your time.